There are few names that command as much respect in cellphones as Nokia's Communicator. In terms of hardware and features, the E7 carries forward the Communicator lineage immaculately. It has been a long time since we laid hands on a device that felt so reassuringly solid. Although slightly reminiscent of the N8, the E7 is cleaner, with fewer buttons and ports littering the sides, giving it a much more polished look. Yes, this is a phone you can flaunt. The front is dominated by the 4-inch AMOLED capacitive touchscreen with just a single key beneath it, to serve as a waking up, menu and back button. 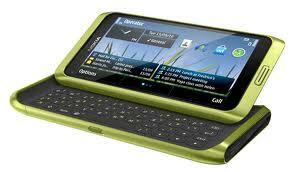 Sliding the screen reveals one of the most spacious QWERTY keyboards seen in recent times. On the back is an 8-megapixel camera, but alas, no autofocus, but with a capacity to shoot HD video. The innards of the device are impressive too -- a 680 Mhz processor, which is the fastest seen on an E series device, every connectivity option you can think of (HDMI, USB on The Go, as well as Bluetooth, Wi-Fi , 3G and the like), & 16GB of non-expandable storage. While Symbian 3 does perform admirably as compared to its predecessors, it has none of the intuitiveness and speed that one has come to expect from Android and iOS. The touchscreen is wonderfully responsive and a pleasure to use but the widgets on the three (just three!) customisable homescreens still behave erratically, refusing to update at times. You need an Ovi Account to access your Twitter and Facebook Accounts through the Social Networks app on the phone, the default Web browser remains sluggish, you are forced to update the Ovi Store when you launch it, there are fewer apps than iOS and Android, and you cannot get a full QWERTY onscreen keyboard to type in portrait mode (a shocker in a display this big). We also were surprised to see mails in our Gmail account taking significantly longer to arrive on the E7 as compared to the iPhone 3GS and BlackBerry Bold 9700 -- something never seen on an E series device. Round that off with eccentricities like a firmware update that wipes out your contacts and you can see why Symbian 3 is the Achilles Heel of the E7. This is not to say that the E7 is a bad device. It has a terrific QWERTY keyboard, great display, good calling quality, and most impressive, a battery that lasts comfortably more than a day. These are offset by a mediocre OS and a camera that is frankly embarrassing (the E72 takes better snaps). One of my colleagues summed up the E7 quite aptly when he remarked: "Fantastic hardware. Great design. If only it was Android."